Karen shares a healthier chocolate fudge brownie bake that is lower in calories and fat, something you can enjoy whilst following a healthy New Year diet without too much guilt. One of the things that many people miss when watching their weight or following a diet is not being able to enjoy a sweet treat, and chocolate usually tops that list of desired but unacceptable snacks. I am lucky as I don’t have a sweet tooth, and it’s cheese and savoury food I crave when on a diet, and of course cheese like sweets and chocolate is high in fat and calories. However, now and then I really crave something baked, such as cake or biscuits, and so I decided to create a healthier bake that is lower in calories and fat, something that I can enjoy whilst following my healthy New Year diet without too much guilt. Chocolate is not that bad for you if you enjoy a high cocoa solids style of bar – such as a 75% to 85% chocolate bar – it’s usually the lower cocoa solid bars that have all of the extra sugar added as well as other flavourings that are not ideal. And, when baking, pure unsweetened cocoa is a great ingredient to use, especially in cakes, tray bakes and brownies. 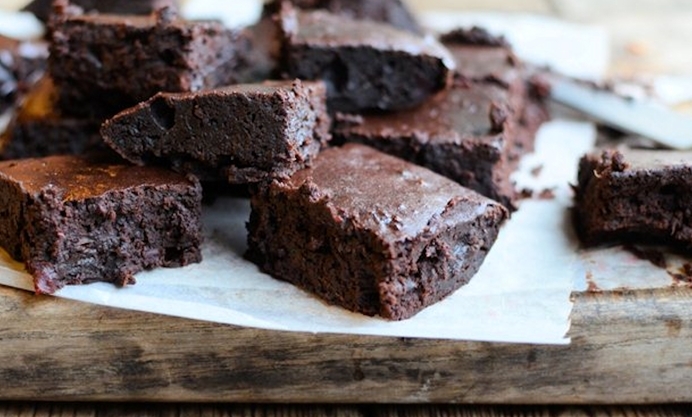 I am not a chocoholic by any means, but I do like chocolate cake and squidgy, chocolate fudge brownies as a treat with an afternoon cuppa now and then, so I decided to create a lower-calorie and lower-fat brownie recipe. The recipe for these Virtuous Chocolate Fudge Brownies uses NO fat and in place of the usual butter or vegetable oil, I have used pureed prunes and beetroot – and trust me, you CANNOT taste them, and they actually add to the “fudgy” texture of these virtuous brownies, as well as adding a richness and moisture that takes the place of high calorie butter or oil. 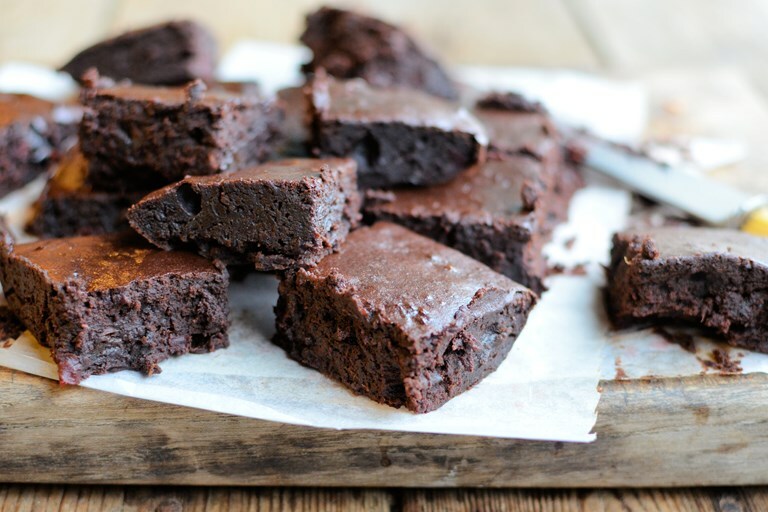 You can pop one of these brownies into the kid’s lunch box knowing that there are a few “hidden” five-a-day ingredients in them, and each brownie square is only 65 calories – which is MUCH healthier than a packet of crisps or a chocolate bar. These brownies do have sugar in them, but, with the absence of the fat and by using less sugar than usual, you can cut back on the calories, which makes them suitable for anyone following the 5:2 diet too, or any other low-calorie diet plan. I was very pleased with the results, which rewarded me with very chocolaty tasting brownies with a dense and squidgy centre, as you may be able to see from the photos……in fact I almost preferred them to the usual oil or butter laden ones that are far too rich for me. I hope you enjoy these brownies as much as we did, and if you use soft brown sugar, you will get and an even fudgier brownie, which may appeal more to you and your family.